In an interest to move my personal data away from the hands of corporations, I am looking to close my gmail account and start using a self-hosted solution; however, I currently use the web front-end client for gmail a lot. I already have my own server and domain. I am flexible about the mail server-side software, and more interested in finding a full-feautred open source replacement for the gmail web front-end client -- but if someone recommends something that provides both the backend and the frontend in one package, I would happily use that. Obviously, it must be hosted on my personal server and can't upload my personal info to anywhere. Open-Source (although I don't necessarily need it to be free as in freedom), otherwise I would have no way to be sure that  remains true. Support for something similar to gmail's "plus addresses" - e.g., email sent to wbarlow+mailinglist@example.com will be seen in my wbarlow@example.com inbox. I think this would only work if it was supported by the back-end as well. A calendar feature (if that calendar supports automated notifications, even better -- and if it supports SMS notifications, I'll be blown away), but I can always install a separate calendar application. 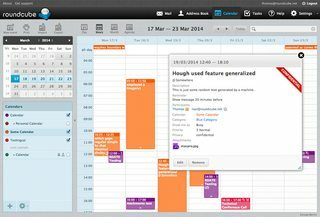 Some sort of open-ended integration/plugin system with other calendar softwares would also be a great option. A moderately active development community that is open to source code contributions. I'm open to software written in any language. It doesn't necessarily need to be free (as in coffee), but that does usually come with open-source. When looking for "complete packages", iRedMail and Kolab are the obvious "master candidates". I've investigated both of them for my own use, but like you found Kolab a bit "overkill" (especially as I wanted to run the stuff on a Banana Pi, and there's no official repo for ARM packages). hosted on my personal server: Yupp, that's the idea behind it. Open-Source: Yes. Both are "suites" composed of open-source elements, with an additional wrapper for easier maintenance. 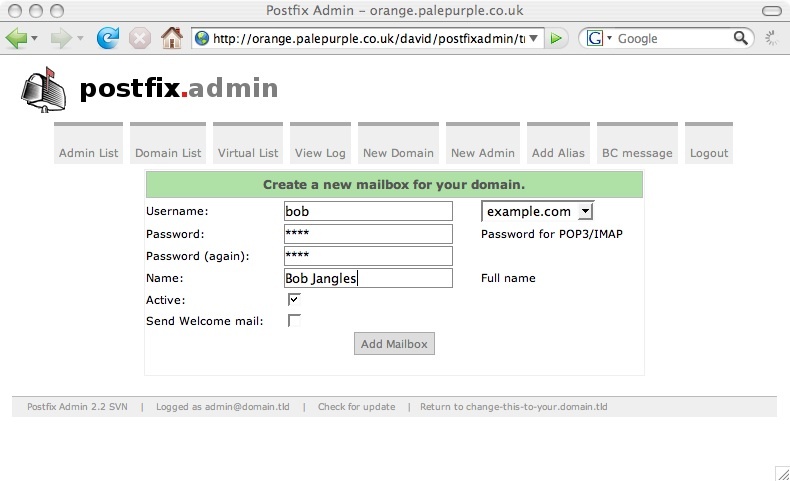 iRedMail comes with very limited administration interface here, wanting you to "buy the big brother" – but you can instead replace it by PostfixAdmin, which it is based upon, and be back completely to open source. Threaded conversations: Threaded views are available in Roundcube, the webmailer used by both Kolab and iRedMail (and most likely in your mail program as well). Roundcube even lets you store your answers in the same folder with the mail you've answered to, so the complete conversation should be together. (btw: Roundcube can be extended with many useful Plugins – I'm using that in my setup, and really like it). Basic filtering functionality for incoming messages: Even advanced. Again, take a look at managesieve. You can even enable a vacation-message from within Roundcube. Basic Address Book functionality: Roundcube ships with that, yes. But there are other address book plugins: for domain-wide contact storage ("shared contacts"), WebDAV, and even an automated address-book auto-populated with all the users you host on your domain or server (MultiBook – check out the development branch, it just got a boost. Disclosure: I was causing that boost, and contributed to it a little ;). 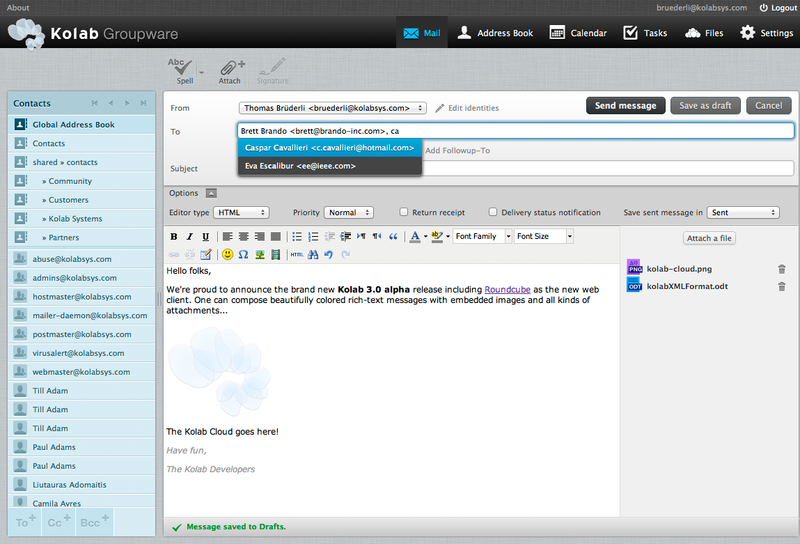 Easy-to-use and nice-enough-looking interface: For webmail? Definitely, that can be said about Roundcube. 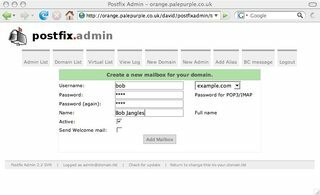 For the admin interface I cannot tell, as I don't use those suites – but above mentioned PostfixAdmin (which you will certainly use with iRedMail) is pretty easy and straight-forward. Might not win a beauty price, but looks good. A "markdown mode" when composing messages: Didn't see that. 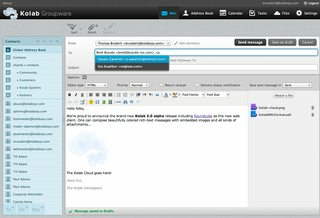 Though Roundcube allows for HTML mails, if that's OK with you. Spam-detection engine: Yepp, integrated. AFAIR AmavisD with SpamAssassin and some more stuff. Support for something similar to gmail's "plus addresses": I can't answer that, sorry. 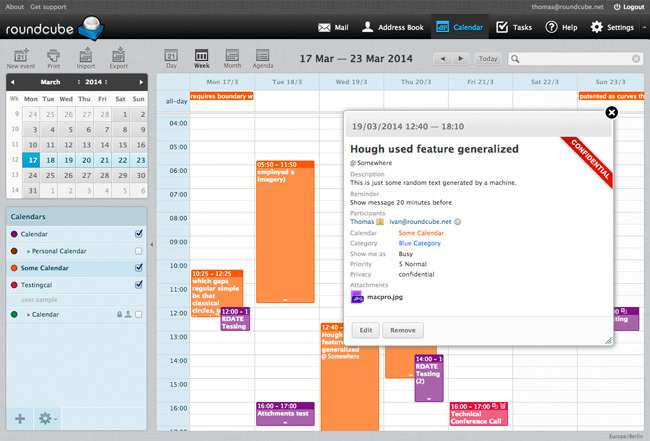 A calendar feature: AFAIR, both Kolab and iRedMail have that, yes. A moderately active development community that is open to source code contributions: well, moderate might be an understatement – so yes :) Especially that iRedMail admin seems to be everywhere. Not the answer you're looking for? Browse other questions tagged open-source web-apps email email-client or ask your own question.